Since the early 1950s, Bell Helicopter started development of the tiltrotor concept starting with the XV-3, X-19 and X-22 with the goal of creating an aircraft that has the advantages of VTOL flight like a helicopter while attaining the speed and agility of a fixed-wing platform. These early developments showed promise as each gained more capabilities than the previous concept. The concept reached fruition with the XV-15 two-place aircraft which is being developed into the BA609 for commercial applications. For the US military however, the VX-15 lead to the first practical application, the V-22 Osprey. While the V-22 experienced a number of teething problems as radical concepts will create, these problems were overcome and the Osprey has entered service with the US Air Force as the CV-22 and with the US Marine Corps as the MV-22B. The Osprey has served in combat operatons in Iraq and Afghanistan as well as with Special Operations Command. 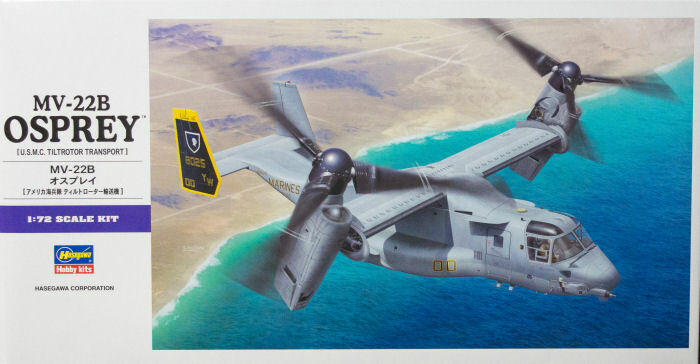 Hasegawa has released the MV-22B Osprey in 1/72 scale and I like what I see so far. They're not the first to market with the Osprey as Italeri has produced kits in 1/72 and 1/48. I think it is safe to say that Hasegawa has produced the best Osprey kit in any scale with this release. The decals are nicely printed and feature a nice set of airframe stenciling and walkways. There is a few interesting parts in this kit, the first serves as the entranceway and forward bulkhead (part A6) for the main cargo compartment even though the crew entry door is molded closed and the ramp/door in the tail is also closed. Either there was an effort to put an interior in this kit or perhaps they'll finish what they've started sometime in the future. There is also an interesting part (D11) that represents part of the main cabin deck as well as the main wheel wells. It has the mount for the display base molded into it so this is a structural part that will need to be glued solidly in place should you want to display this model on the stand. This is a really nice looking kit that isn't complex, so this should be an easy build for most modelers. This will be a fun build for the average modeler and provide some interesting opportunities for the AMS modeler that will want to do that little bit of work to enhance the kit. Either way, this Osprey kit is a welcome addition to scale flight lines everywhere.